This Whey protein product in a 5lbs bag contains in it's formulation: NitroSerum, Microfiltered Whey protein concentrate, Cold pressed Whey Protein Isolate, Hydrolyzed Whey Isolate, ActiNOS Whey Protein Hydrolysate. Besides containing all of these Whey protein types it also is formulated with Modified Starch, Oat Powder, Inulin and soybean powder, among many other ingredients. 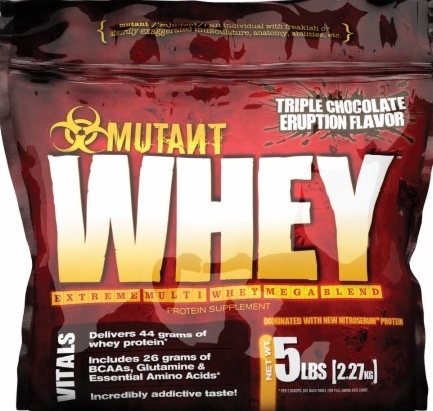 Each serving is 1 scoop of about 37grams per scoop, there are about 62 serving in each 5lbs bag of MUTAN Whey. Taste and mixability were good. Had pretty decent results after a couple months of use. This stuff got the job done as a filler, but it is full of sugar and really tastes like corn syrup after a few shakes. Probably not the highest quality calories to be consuming.